This particular cover from Marvel Two In One Annual #7 has to be one of my all-time favorites. Mainly because as a kid this particular issue was one of my all time favorite comic books ever. It’s a straight up boxing tournament where earth’s mightiest, Marvel’s heavyweights are all gathered to take on none other than the Champion. An unbeatable blue skinned red haired freako alien boxing fanatic put’s our favorite hero’s into a contest to simply see if any can actually provide a sufficient challenge to him. You name it Marvel’s strongest are all here Sasquatch, Colossus, The Hulk, The Thing. 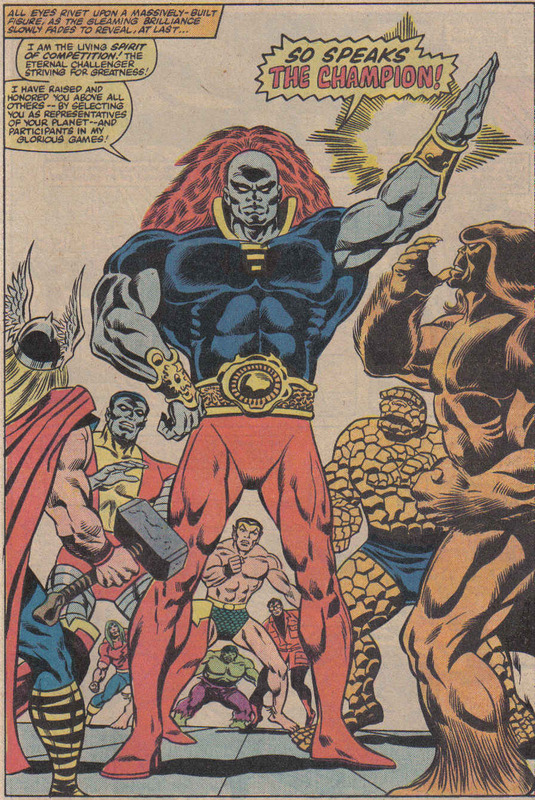 Yeah they all get their asses served (well technically The Hulk never gets to fight cuz he freaks out in the ring and The Champion refuses to battle a wild monster), all except The Thing who does put up a decent fight. The smackdown though Mr. Grimm takes however is quite brutal and bloody especially for an 80’s comic. 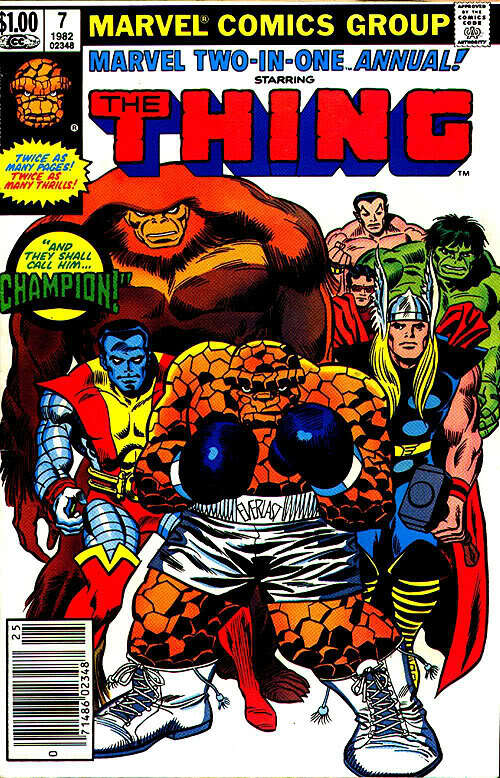 It always bummed me out that The Thing lost at the end but he definately gives the Champion a run for his money! I LOVE this comic! I was always ticked the Champion DQ’d Thor for using his hammer. I mean c’mon you’d think he’d do a litte research? Colussus was always a favorite of mine and I thought he just wimped out like a little girl. Awesome blast from the past Pete! Thanks! I have that comic book in good condition but not sure what its worth help please? From what I know it’s not worth a lot but it’s a good one regardless! !